After our successful adventures skiing a mighty five foot drop in front of the old farm house, I set to finding a local ski area so everyone could experience their first ride on a chair lift. This was 1969, long before the internet, and I don’t really remember just how I went about finding a place to ski somewhere near the western part of the Catskill Mountains. I suppose I hunted for ads in a magazine. I know you are far too young to remember them, but magazines were kind of paper blogs. Regardless how I found it, I did come across what sounded like a superb hill. It was across the Delaware River in the Pocono Mountains of eastern Pennsylvania. It was not a particularly large ski area, just one side of a rather short mountain, but it did have a chair lift running up the side of what looked like a fairly gentle slope. A first-time skiers paradise. We packed into the van and headed on winding roads through the forests. A surprise was in store. It was a nice sunny day and the “ski resort” looked good as we drove in, a cozy lodge looking through the bare hardwood trees surrounding the groomed run. I knew from their brochure there was only one run. Yet I was immediately struck by how small this “ski mountain” was. Perhaps a 700 foot drop. And, yep, there was an actual chair lift packing people up the left side of the open run. On the other side of the run was something I had never seen — a line of snow making guns running the full length of the run. Between the lift and the guns was an treeless hillside some 500 feet wide. And that was it! The entire “ski mountain”! But it was a ski area all the same and we were all glad to be adventuring. I parked. We opened the doors. And instantly my second shock at skiing the Poconos came rattling through my brain. Take a hill full of folks skiing. Add two metal skis to everyone on the hill. And then make the hill a dome of ice. Not snow, which dampens the sound of skis. Especially metal skis. The racket was astounding. Amazing. A thousand small caliber rapid fire machine guns would have been drowned out by the sputtering clanks of chattering skis echoing over the countryside. During a break from skiing the good folks in the lodge explained the snow cannons were not run on the weekends so the skiers can enjoy the run. We were there on a weekday. We all learned how hard it is to fall on ice. And what it is like to move through a fog of blasting ice crystals spewing from water cannon. And we never went skiing again. This entry was posted in Buck Brook Farm, Hitchhiking, skiing, Uncategorized and tagged lessons learned, Pennsylvania, Pocono Mountains, School, snow cannons on December 25, 2016 by deansgreatwahoo. 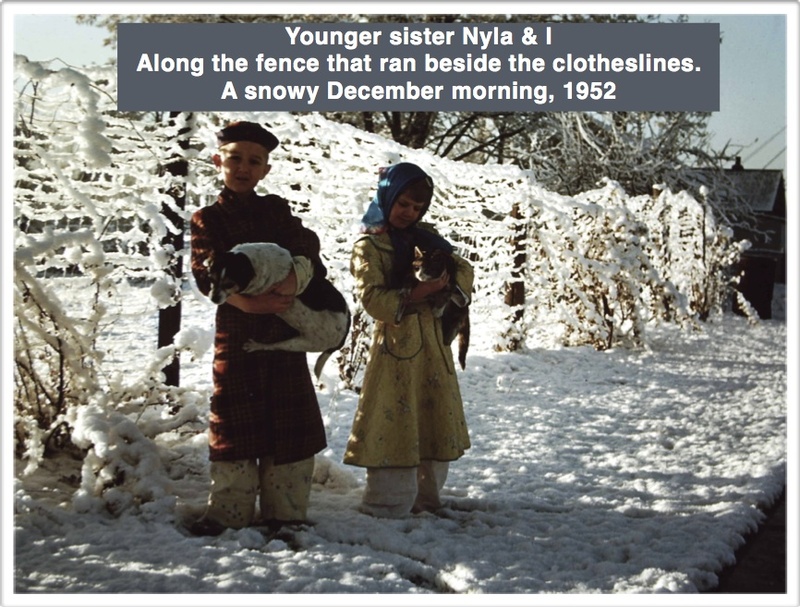 I got to Buck Brook in the fall of 1969 and it wasn’t long before the snow was gathering. Having been raised at the base of a ski mountain in the West, the staff and students figured I’d make an excellent ski instructor. “Just take the kids out to the hill in front of the farm house …” was the Head Master’s solution to finding a place to get ski legs under folks from ten to twenty-two. Well. The “hill” in front of the farm house was about fifty feet long. The snow by this time was close to two feet of powder. Less than a third of the the “hill” in front of the house was steep enough to pull skies through that much fluff. But you ski what there is to ski. So we got together on a sunny afternoon after rounding up boots and skis and poles. Kids and staff figured out the double-laced leather boots of the time and got somewhat used to tromping through snow in stiff boots while carrying awkward equipment to the front of the farm house. They struggled with the cable bindings, the bane of “safety” requirements until step-in bindings were developed. And we lined up on top of the hill. I don’t remember having much to say but am sure I explained some principles of the snowplow turn. Mostly I remember just pointing my skis downhill and letting ‘er rip. I’ve never been much of a powder skier and don’t know why I didn’t think to have everyone sidestep down the hill to pack the snow. The run was perhaps fifteen seconds long but enough to have me thinking this just might be a lesson that turns everyone off to skiing. I stopped and turned and watched as Chaney, another staff member, turned to the hill, held her poles out, and started to slide. Within two feet she was in trouble and within four she was making a spectacular display of flying snow covering her face and getting into every possible opening of her less-than-ski-worthy warm clothes. A complete disaster. What was I doing? What to do now? Failure, failure, failure. Everyone immediately pointed their skis downhill, held out their poles, and let the snow fly. By the end of the day I was looking for the closest ski hill for a soon-to-enjoy outing. This entry was posted in Buck Brook Farm, Hitchhiking, New York State, skiing, Uncategorized and tagged Catskill Mountains, lessons learned, School on November 21, 2016 by deansgreatwahoo. Atlanta to Alturas Lake #9: Dumped! The return trek from Alturas Lake to Atlanta was going along just dandy when Dad learned a lesson about kindness to animals. When picking up the pack horses from Atlanta locals, I watched as the man we were renting them from showed my dad the secret to cinching a pack saddle on a horse. A pack saddle is held in place with a belt that loops under the horse’s rib cage. With the saddle in place the man ran this belt under the horse and through rings on the saddle to cinch it tight. Several times, he did what he could to get the saddle tightened down when the horse let out it’s breath. Then, when things were good and tight and there was no more cinching to do, he pulled hard on the belt and delivered a serious kick right in the horse’s ribs. The horse snorted and the belt slipped two or three inches through the rings and got tied off. “They’ll always keep some room and if you don’t get it tight they can drop their load any time they choose,” was the man’s advice. Even so, I felt sorry for the horse. The return from Alturas Lake followed the same steady climb we had come down from the summit, across the meadow of blue flowers, and on down the valleys of Mattingly Creek and then Middle Fork of the Boise River. Even we kids knew going down is the dangerous part of climbing. That’s when heads hit rocks hard during a fall. And we remembered going up a very steep and very rocky section of the trail some five miles out of Atlanta. We kids got off the horses to pick our way down that several hundred feet. It was right in the center of that steep and difficult part of the trail — right where it was the steepest and dustiest and most awkward — the pack on one of the horses simply slid to one side and landed in the powdery dust. The horse didn’t look one bit sorry about it, either. Indeed, he seemed quite pleased with himself! I was too young to help unpacking the bedding and canvases and heavy pack boxes there on that steep slope. Nor do I remember if Mom and Dad carried all the goods to a more level place to pack them back on the horse, but it sure seems they could not have saddled and packed that animal in as steep a place as the horse was standing. What I do know is that horse got a damn solid kick with Dad’s boot when the saddle was being cinched up. And the horse looked completely convinced it had been worth it. This entry was posted in Back country camping, Idaho Events, Kidhood, Sawtooth Mountains and tagged horse packing, horses, lessons learned, steep trails on October 20, 2016 by deansgreatwahoo. I swear I have always put the tools away when I finish a job. My sister Vicky, two years my senior, definitely remembers my not putting away a hammer. We were raised in a garage. 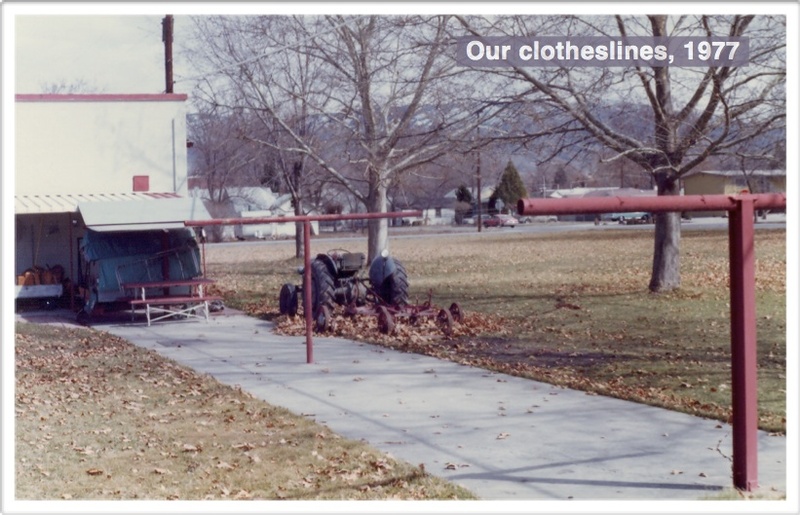 A full half of our home was dedicated to three large garage doors that served my parent’s tractor and trailer rental business. 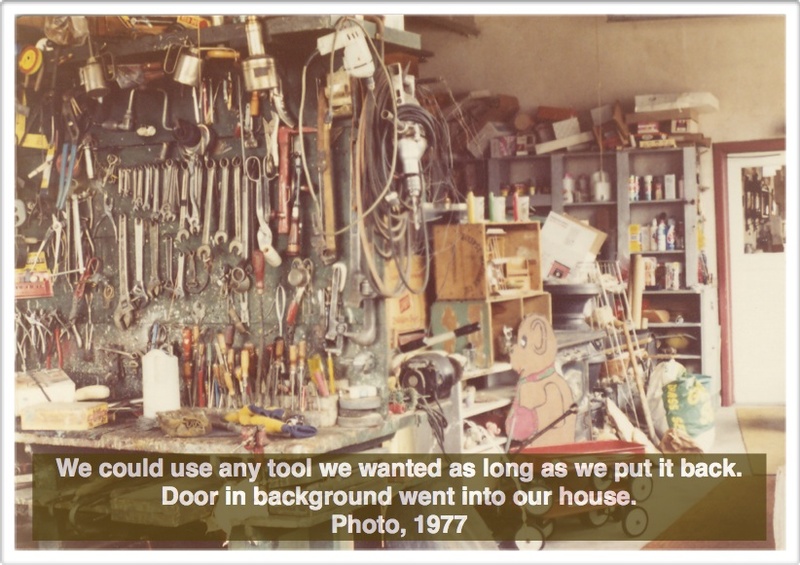 We kids could use any tool in the garage except the power tools, but there was one rule: we had to put the tools back where they belonged. On the other end of the house from the shop we had a long patch of cement, actually covering two big septic tanks as well as some extra ground. Over this cement were clotheslines. From the end of the clotheslines, around the house and to the last of the garage doors, was more than half a city block. It seems I had some important project to hammer out on the far end of the clotheslines. When I was through I dropped the hammer on the ground and went about my business. By the time my dad noticed the hammer was missing and figured out where it was and why it was there it was late in the evening, an inch of show had fallen, and I was getting ready for bed. Or perhaps Dad waited, just for the dramatic effect. Whether bad timing or timed for effect, I found myself being pulled out of a nice warm shower, dripping wet, and planted naked out the back door of the house, my feet in snow. I was told the garage door was open and I could get back in when the hammer was where it belonged. Vicky assures me I was the most pissed off wet little naked boy, running and screaming in the snow, that you have ever seen. This entry was posted in Kidhood and tagged big sister, glad I learned, lessons learned, pissed off, putting away, tools, wet naked little boy on July 23, 2013 by deansgreatwahoo.